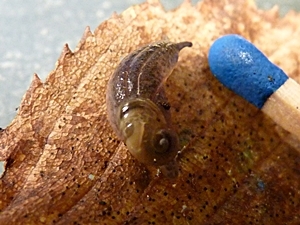 The Daudebardiinae is closely related to the true glass snails. According to the latest state of knowledge, the Daudebardiinae are a subfamily of the Oxychilidae, among which are, for example, the cellar snail (Oxychilus cellarius) and the garlic snail (Oxychilus alliarius). On the first glance, Daudebardias remind of slugs. Their shell is reduced to such an extent that the adult snail is not able anymore to withdraw into it. Juveniles still can, as their shell, in relation to the body is still larger. The shell reduction in Daudebardias is an adaptation to the snails' life: Daudebardias mainly live underground, feeding on earth worms, insect larvae and smaller snails. feeding on earth worms. Source: biolib.cz (Jiří Novák). In mountain and hill country, where they live in humid places, mostly near springs, they hunt for food under the leaf litter and loose rock rubble. The systematic name Daudebardia received its name after the French naturalist and malacologist André Étienne d'Audebard de Férussac (1786 - 1836), as do the ground snails (Ferussaciidae). A daudebardia of unclear species from the Vienna Woods. Description: The small shell the reddish Daudebardia carries at the end of its back has a reddish horn colour, but can also be whitish or yellowish. Though it is too small for the snail to withdraw into it, it displays 2½ visible whorls, the last of which is strongly elated. The embryonic whorls (primordial whorls) are surrounded by the apertural whorl. The snail itself has a greyish blue colour, the lower part of the foot is more lightly coloured. Dimensions: H: 1.5 mm; W: 3.5 mm; L: 5 mm; N: 2½. Body length: 17 - 20 mm. (Abbreviations). Habitat and Distribution: The reddish Daudebardia lives under leaves and stones in humid mountainous forests left to nature, often near water. 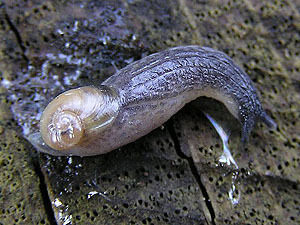 The snail living mainly underground avoids mouldy habitats and acidic ground. The reddish Daudebardia feeds on earth worms, insect larvae and smaller snails, which are eaten whole. The species' distribution area covers northern Algeria, Asia Minor and Europe. Daudebardia rufa can be found from the Balkan Peninsula over the Carpathian foothills, the Sudetes and Central Germany as far west as the Rhine valley and as far south as southern Italy, Sicily and Sardinia, as well as southern Anatolia and Cyprus. In Switzerland, the reddish Daudebardia lives in altitudes of up to 1000 m MSL, in Bulgaria between 500 and 1500 m MSL. Threat Situation: The reddish Daudebardia in Europe only appears rarely and in a disperse manner. Because there are only few forests left to nature and they are usually used by forestry, the Daudebardia usually finds only few suitable habitats left. In Switzerland, Bavaria and Vorarlberg the species is therefore classified as endangered (EN), in the rest of Austria and Germany, it is generally classified as vulnerable (see also: IUCN Threat Categories).